Are you interested in communication, media, literature, language, and culture? Do you excel in reading and writing? Do you wonder about the way the English language works and how it shapes what we say every day? Are you ready to engage in active discussions of issues that affect you, your country, your generation? The UBC English Major may be the program for you. English courses enhance writing and presentation skills, reading and analytical competencies, and critical and creative thought. A major in English will enable you to practice and hone these skills, giving you a solid foundation in critical analysis, historical knowledge, and contemporary discourse. An English Major will prepare students for any profession in which linguistic awareness, analytical thinking, and communication are important. Taught by world-renowned, prize-winning scholars, in small classes, UBC English courses cover an amazing variety of topics, from Old English to Canadian English, from medieval ecology to indigenous science fiction, from the history of dictionaries to the influence of texting, from Shakespeare in film to transsexuality in television; from ancient rhetorical theory to cognitive approaches to language today. To declare the major, prospective English students must complete 27 credits, and either Arts One or the Coordinated Arts Program or six credits of first-year English, or WRDS 150 plus three credits of first-year English. Students particularly interested in the major are encouraged to take ENGL 100, “Reading and Writing About Literature.” ENGL 100 introduces students to the fundamental principles of literary, linguistic, and humanities scholarship with a particular focus on how we write in the discipline. Our other first year courses cover basic approaches to literature, non-fiction prose, literary criticism and theory, and language study. Once declared, second-year majors can choose the Literature emphasis, the Language emphasis, or our new combined emphasis in Language and Literature. Literature students must complete ENGL 200, our brand-new, seminar-based introduction to literature studies, team-taught by some of the best faculty in the business. Students in the language emphasis must complete ENGL 229, an introduction to the many areas of language study taught in the department including structure, stylistics, history of the language, rhetoric, and cognitive linguistics. As well, students in these two emphases take another 3 credits of one of our awesome second-year courses covering such topics as Graphic Novels and Comics, Science Fiction and Fantasy, Film Adaptation, Contemporary media, indigenous literature, plus literatures of Great Britain, Canada, the United States, and around the world. Students in the combined emphasis are required to complete ENGL 200 and ENGL 229 to get a full introduction to both methods represented by that program. In third and fourth year, English literature majors take a selection of courses from four main areas: Medieval and Renaissance Literatures; Eighteenth- and Nineteenth- Century Literature; Modern Contemporary, Transnational, and Indigenous Literatures, and Media, Theory, Genre, and Special Topics. They also take one course in Canadian Literature. Language Majors take ENGL 330 and 331, to gain a comprehensive understanding of the structure of modern English, plus a selection of courses in History of the Language, Rhetoric, and Discourse Analysis. Students in the combined emphasis also take ENGL 330 and 331 and a suite of courses from both the literature and language programs. In fourth year, students take one research seminar (ENGL 489 for language, ENGL 490 for literature) on a specific topic or field of English literary study. Talk to an advisor about how to build a suite of courses in a particular area or stream that fits your interests and ambitions. CAN A MAJOR IN ENGLISH HELP TO START MY CAREER? English degrees are a hot commodity on the job market. Knowing how and why media and communication work can give you a huge advantage in today’s rapidly-changing work-world. Employers know that only applicants with skills in critical thinking and writing and who understand the power of language and media are ready for its challenges. English grads are teachers, lawyers, journalists, publishers, actors, entrepreneurs, consultants, even Prime Ministers. CAN I COMBINE MY PROGRAM WITH AN AN ENGLISH MAJOR? An English Major can complement any major or honours program in Arts or Science. Current English majors are also studying economics, political science, psychology, biology, environmental studies, history, geography, anthropology, and visual art. Talk to an advisor about how you might develop a double major that will meet your goals and interests. CAN I DO AN ENGLISH MAJOR WITH CO-OP? Yes you can! English majors can work with the Arts Co-op Program to gain enriched educational experiences for personal and professional growth. The Program works with a diverse range of community partners and sectors to provide transformative workplace learning for co-op students.Co-op is a high-impact educational program that allows students to alternate academic terms with paid, relevant work experience. The Program allows students to explore different career options, while gaining 12-16 months of paid, professional work experience and a network of contacts. For more information click here. HOW DO I DECLARE A MAJOR IN ENGLISH? There is no minimum average for admission and no formal application is necessary. 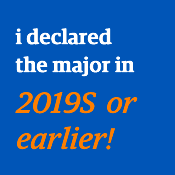 During registration periods, and if you have completed all the pre-requisites, you can declare the major online through the registration portal! If you have completed the pre-requisites and you wish to declare the Major outside of the registration periods, please send an email, stating your intent, to the English Language and Literatures Undergraduate Program Assistant at English.Undergraduate@ubc.ca with the subject line: DECLARING ENGLISH MAJOR. Include your full name and student number.